Another benefit Invisalign provides is brushing and flossing with ease since your aligners are removable. You should plan on brushing at least twice per day and flossing at least once. You may also find yourself wanting to brush after lunch before you put your aligners back on, so carrying a toothbrush with you can also be helpful. 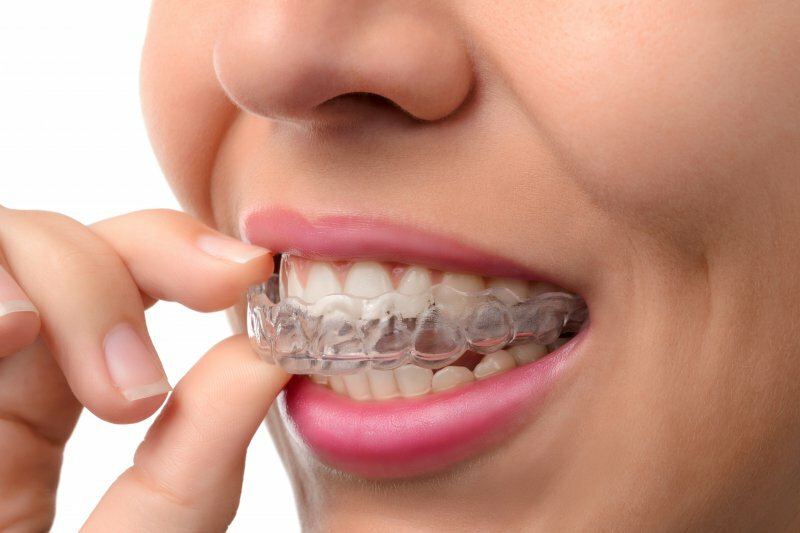 It’s important to keep your aligners clean in order to ensure fresh breath and beautiful smile. Aligners are easy to clean by gently brushing and rinsing them in lukewarm water. Rinse them at night and in between meals for the best results. When it’s time to eat, your aligners can easily be removed so you can enjoy all the foods you would normally eat without the restrictions of traditional braces. Patients love the freedom they have with Invisalign when it comes to enjoying food. Invisalign doesn’t interfere with sports activities and you won’t have to worry about injuries to your mouth like you do with metal braces. If your sport requires that you wear a mouth guard for protection, you can easily remove your aligners and replace them with your guard until your event is over. Invisalign aligners are easy to wear and require minimal effort from you to be successful. Just following these few guidelines will help ensure that treatment goes smoothly and efficiently for you so you’ll be enjoying your new smile in no time. For over 35 years, Dr. Gary Henkel has been taking care of patients in Philadelphia. Patients enjoy the personalized care and attention they receive when they choose Horsham Dental Elements as their dental home. Dr. Henkel is also a certified Invisalign provider, which means he can guide you through the process from start to finish. If you’d like to contact Dr. Henkel, he can be reached through our website, or by calling 215-672-6666.